A Roof Certification Inspection is typically done as a requirement for your homeowners insurance policy. 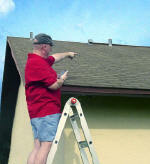 This type of inspection documents how many useful years you can expect from your roof. This information is then given to your insurance company to comply with the renewal of your homeowners policy. The inspection typically takes about 1 hour to complete and is comprised of the report and photos of your roof. You then give this information to your insurance agent for your homeowners policy. Check with your insurance agent and ask if it would be advantageous for you to have a Wind Certification Inspection at the same time. This inspection documents how resistant your home is to a hurricane. Based on this inspection you may be given substantial insurance discounts. We offer a discounted price when both inspections are completed on the same day. Why use AllPro Home Inspection for your Roof Certification Inspection? A building code official duly authorized by the State of Florida or its county's municipalities to verify building code compliance. All of our inspections are completed by a State Certified Building Contractor who has been building and inspecting homes in SW Florida since 1986. No need to wait for your reports. AllPro Home Inspection utilizes state of the art computer equipment to generate your reports on the spot! We complete the inspection with required pictures, print, sign, and deliver your certified report to you minutes after the inspection is completed! Same day, next day appointments for these inspections can usually be accommodated. If you want an inspection in time for the next hurricane season, contact us today at: (239) 945-2414.